GoPro’s HERO6 Black has arrived, and while it might not have the slick 360-degree features of the GoPro Fusion, 4K60 support is not to be ignored. Promising better digital stabilization, more involving colors and broader dynamic range, and a handy touch zoom, not to mention swifter wireless, you get a lot for your $499. I put on a helmet and got temporarily EXTREME to see how it holds up. The camera itself looks virtually identical to the HERO5. On the front there’s a small monochrome LCD for basic status, plus the protruding lens; on the back, a full-color touchscreen. A button on the side handles power and switching modes; one on the top starts and stops recording. The battery and microSD card load at the bottom, while a mini HDMI port and USB Type-C port are on the side. With both hatches closed, the HERO6 is waterproof to 33 feet. I’m not typically an EXTREME sports person, so GoPro decided to put me in a couple of unusual situations to put the HERO6 through its paces. To see how the new digital stabilization worked, I started out in an electric go-cart. GoPro is calling it the company’s most advanced system yet, and the results certainly look impressive. Compared to the stabilization on the HERO5 there’s noticeably less wobble and wiggle in the corners of the frame. After that, I unceremoniously hoisted my exercise-shy body onto an e-bike and headed out from San Francisco’s Golden Gate Park. That was an opportunity to test the HERO6’s voice control – it can recognize commands across ten languages, including switching modes, and starting and stopping recording. Since I often have issues with voice recognition systems (particularly in cars, unless I adopt an unconvincing Valley Girl accent) I was curious to see how GoPro’s version would handle it. Turns out, with the language set to UK English and a fairly loud shout, I had a reasonable success rate. That is, when I could remember the commands: say “GoPro start video” for instance and the camera will do nothing, since it’s listening out for “GoPro start recording” specifically. There’s a list of the supported commands available through the HERO6’s touchscreen, but it’s buried in the settings so doesn’t exactly lend itself to access while in the midst of an activity. It’d be great if, had the camera heard its “GoPro” trigger word but not recognized the specific instruction, it flashed up some suggestions of what you should actually be saying on the display. Once you’ve got all that footage, then you need to transfer it off the camera. If you’re using a PC or Mac, you can plug in via the included USB Type-C cable and drag the files right out: however, it’s worth noting that some resolutions, notably the 4K, use the HEVC codec not H.264 and so you might encounter issues with playback. What GoPro is really pushing is its mobile app. Rising video resolution and quality options has meant file sizes are soaring: there’s a reason the default minimum storage size in 4K-capable smartphones is increasingly becoming 64GB. You can of course switch out the HERO6’s microSD card if you need more capacity, but getting the footage over to a mobile device generally depends on wireless speed. Happily, GoPro embraced 5GHz WiFi this time around, with the promise of roughly 3x faster file transfers to your iOS or Android phone. Of course, if you’re shooting at the maximum 4K60 resolution that speed bump is going to be offset by larger file sizes too. Shorter clips whip across in a matter of seconds, but there’s still some waiting involved if you have anything longer. You can, at least, leave the transfers running in the background as you do something else with your phone. It’s worth the wait, though. While you can edit footage in your choice of app, GoPro’s QuikStories feature promises to do it all for you. It uses the new GP1 chip on the HERO6 itself, combining data from the accelerometer and other sensors with analysis of the content of your clips to figure out the best parts, like when faces are visible. It’ll even listen out for whoops or cheers – EXTREME sports people love whooping and cheering – and flag those sections as being extra-valuable. That metadata is sent over with the footage itself, and Quik uses it to cook up a highlight reel. It’s not instantaneous, but once it’s complete you can choose between different themes – which each have their own effects and styles – and music. By default QuikStories are square, ideal for Instagram, but you can switch to a more typical wide-aspect; you can also switch from the default 720p to 1080p, and a 60fps frame rate. There’s the option to manually adjust the clips used and the transitions, including dragging out any footage that you don’t want. The title text can be changed, and the overall length of the video that’s generated. Finally, you can upload to Instagram, YouTube, or other services directly from the Quik app, or save it to your phone. The results are surprisingly good. In the video above I left all the transitions and clip lengths at the default that QuikStories selected, and to be honest there are a couple that I’d probably trim or remove were this not for demo purposes. 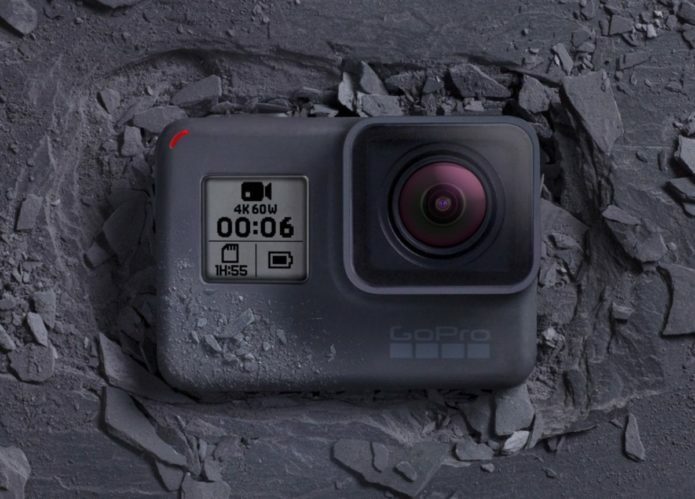 Obviously the more video you have, the more GoPro has to choose from: the company suggested shooting plenty of little B-roll snippets because they add interest when they’re dropped into the mix. Could you leave QuikStories to do all the heavy lifting? Probably not, though it would only take five or ten minutes work to smooth out any odd decisions by the algorithm. It’s impressive that you can do all that on a phone, too, without having to go anywhere near your desktop or laptop. There is, mind, a version of Quik for Windows a Mac, if you prefer. What I’m really curious to see is how QuikStories handles the GoPro Fusion. The upcoming 360-degree camera not only captures an all-around view, but can crop out a regular 1080p widescreen section from any angle. In effect, you’re getting an infinite number of regular GoPro cameras, looking in every direction from where you mount the Fusion. Sadly that functionality – GoPro calls it OverCapture – won’t be available in the mobile app until early 2018. Until then, it’s hard to argue with what the GoPro HERO6 offers. Yes, it’s not inexpensive at $499, but the dramatic increase in wireless transfer speed – not to mention the bump in video quality and the impressive digital stabilization – means the boost in productivity could well offset the cost for many. It’s available to order now.